ELIZABETH CITY, NC – Jeep lovers, there's a vehicle that is both city-friendly and has off-road capabilities. What more could you want? 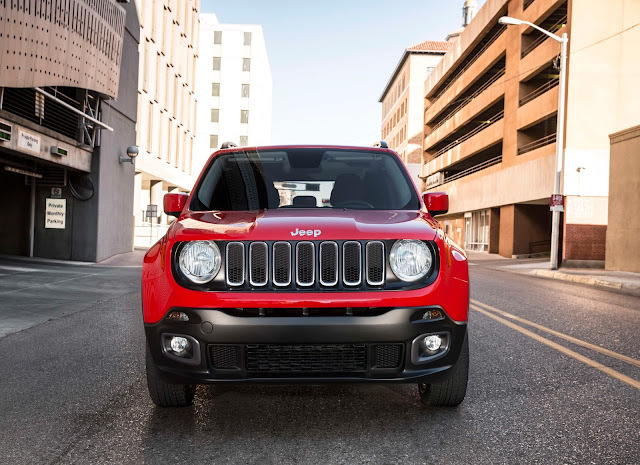 If you don’t know which SUV this is, we’re talking about the 2015 Jeep Renegade. Performs Like a Jeep: Just because it’s a small SUV doesn’t mean you can’t participate in #MuddyMonday. This guy is equipped with the Select-Terrain Dial with auto, snow, sand, and mud settings. For the Trailhawk model you even get a rock setting. Get Those Rays: Small sunroofs are so last season. The 2015 Jeep Renegade has a My Sky open-air roof. When not in use, the panels are locked safely in place. When it’s time to enjoy the open road the panels can be removed and stored in a height-adjustable cargo area so you can adjust as the weather changes. Shift With Ease: 9-speed automatic transmission? No problem! With this new addition you can enjoy the view while driving along with efficiency and unnoticeable shifts. Light the Night: Exploring trails at night can come with lots of unexpected surprises. No need to worry though. In the Latitude, Limited, and Trailhawk model halogen cornering fog lamps come standard. At the flip of a switch you can see everything in your path. Ready for Trails: Hit those trails with the two best systems for off-roading. In the Latitude and Limited model you have the Jeep Active Drive on Sport. In the Trailhawk is the Jeep Active Drive Low. Both systems have a rear axle disconnect system that easily switches from two- to four-wheel drive. Room to Move: With 118 cubic feet of space, there’s plenty of room to stay comfortable on any adventure in the Renegade. Don’t forget all your storage space as well. For extra comfort you have the option of a heated steering wheel and dual-zone automatic climate control. This Jeep is the perfect compact SUV with the best off-roading features. It also has the combination of the rugged design and killer performance you want in a Jeep. You can find plenty 2015 Renegades at your Jeep dealer near Corolla, NC. Perry Auto Group has two dealership locations to serve you better at 1005 W. Ehringhaus St, Elizabeth City, NC, 27909 or 1001 Halstead Blvd Elizabeth City, NC 27909. Stop in for any of your auto or community needs, or feel free to give us a call at (252) 338-9100.